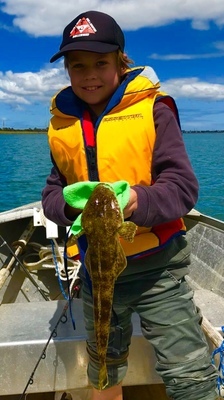 FLAT OUT: Twelve-yeard-old Jesse with a 37cm flathead he caught on bait in the inner-harbour. Pinkies were the drawcard over the past week, with a number of locations in Corio Bay holding fish to around the 2kg mark. Trelly’s Geelong’s Chris Pitman and Daniel Baden fished around Alcoa Pier over the weekend, catching a number of pinkies, pike, salmon and flathead while casting soft plastics. Nearby, the spoil grounds produced pinkies for anglers drifting baits or casting plastics. Pike were taken too, especially on diving hard-body lures. Geelong’s waterfront remained a hot spot for land-based anglers casting soft plastics for pinkies and flathead. Bait anglers should try bluebait chunks fished on the bottom. Snapper reports declined but the odd big fish was still caught off Clifton Springs and inside the bay’s inner-harbour. Salmon schools continued providing entertainment. The area from the Point Wilson Spit as far as the grammar school lagoon was productive, with metal lures or soft plastics catching fish to 1.5kg. Reports of barrel bluefin tuna in excess of 100kg began coming in fom Apollo Bay to Portland. Anglers with heavy gear might want to blow the dust off it and plan a trip west. Fishing the high tide slack water at the Queenscliff marina, I managed salmon, pinkies and trevally. Casting out from the entrance of the channel with Turtleback worms on 1/4oz jig heads was most effective. It was a big week for freshwater fishing, with the ANSA Purrumbete convention run by Melton Sportfishing Club held over the weekend. Many standout captures from a number of lakes across the west were recorded. 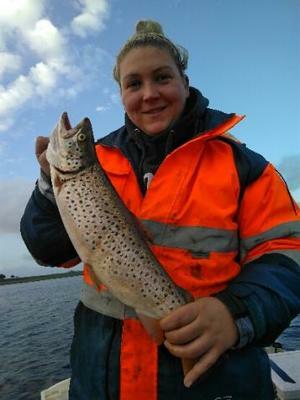 Maia Pawlak caught a 1.6kg brown trout on a pink Tassie Devil at Lake Elingamite, while Lake Bullen Merri was on fire for Phil Callahan who managed a 2.2kg Australian bass on a trolled bibbed lure. Another bass of 2.3kg was also caught, with both taken in five to 10m of water at Potters Point. Other captures included Jim Robertson’s Chinook salmon of 1.6kg and rainbow trout of 1kg, and Kevin Hunter’s 1.3kg rainbow and 700g Chinook. Daniel Sparks caught a healthy 3.45kg brown trout on a clown-coloured Tassie Devil at Lake Purrumbete, while rainbow trout to 1.8kg were taken from the bank on Powerbait at Lake Tooliorook.